Before this account of the cruise is over there are just two more tales to tell. The first concerns our stop in Barcelona. Unlike our first trip there some years back, when we stayed several days in the city, enjoying streets fringed with Gaudi and galleries teeming with Picassos, which compensated for three disturbing encounters with pocket pickers, on this occasion we only really had time to stick to La Rambla. The boulevard was only a short walk from the ship. The first landmark we encountered was Columbus’s statue, erected, as the tourist website puts it ‘in 1888 to honour Christopher Columbus when he disembarked from Barcelona to find the New World.’ It was only a few yards later that we saw the motionless figure of a gold painted man in a golden costume mimicking those of the 15thCentury. We couldn’t take a photo of him as he was charging everyone who did. For reasons I’m about to explain I didn’t feel comfortable giving money away for this purpose. The sheer height of the statue speaks for the elevated regard in which Spaniards still hold this founder of their American imperialist ambitions. So why is this relevant here? [Columbus] launched a colonisation of nature as pecuniary as it was peculiar. 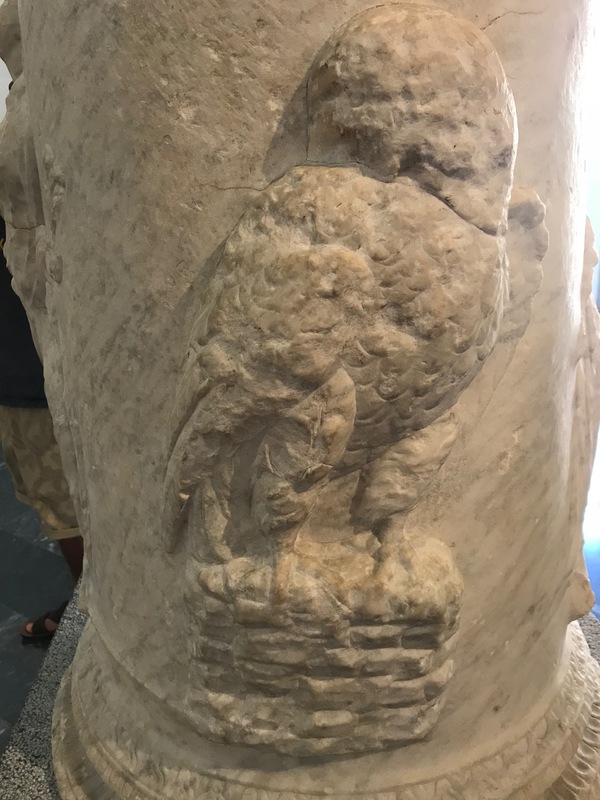 European empires, beginning with the Spanish and Portuguese, obsessively collected and ordered natural objects – including ‘savage’ human bodies – always with an eye on enhanced wealth and power. Columbus’s cataloguing of nature to evaluate (put a price on) it was an early sign that he understood what nature had become under early modern capitalism. I love Spain for many reasons, not least for its culture, language and the warmth of its people. However, if I can’t condone aspects of the history of imperialism of my home country, I’m obviously not going to feel comfortable with the exploitative imperialism of anywhere else. So, yet again the cruise dropped an uncomfortable reminder in my lap. The heyday of national imperialism is long over, but a different kind of imperialism continues with societies that boast industrialised and technologically savvy societies feeling justified in regarding themselves as superior representatives of a global elite. To seek coherence between the spiritual and the material does not imply that the material goals of development are to be trivialised. It does require, however, the rejection of approaches to development which define it as the transfer to all societies of the ideological convictions, the social structures, the economic practices, the models of governance—in the final analysis, the very patterns of life—prevalent in certain highly industrialized regions of the world. When the material and spiritual dimensions of the life of a community are kept in mind and due attention is given to both scientific and spiritual knowledge, the tendency to reduce development to the mere consumption of goods and services and the naive use of technological packages is avoided. There is therefore a lingering and destructive form of imperialism still at work in the world and I was travelling on one of its products. Before I say what the cruise’s second experience was that I want to share here, I’m going to move onto an artist who worked in Spain across the divide between Europe before the French Revolution and Europe afterwards, a time of considerable political and personal tension. Back home I began my efforts to store the pollen of wisdom my bees of reflection had collected during the cruise. This sequence as a whole is part of that attempt. Time now to examine a key figure in art that the prints of Dalí in the cruise ship’s gallery pointed me towards. This was an after-gain of the cruise experience but a result of the cruise none the less. Once I was home I had time to check the background to Goya’s Caprichos, works that he tried to sell in the 1790s. 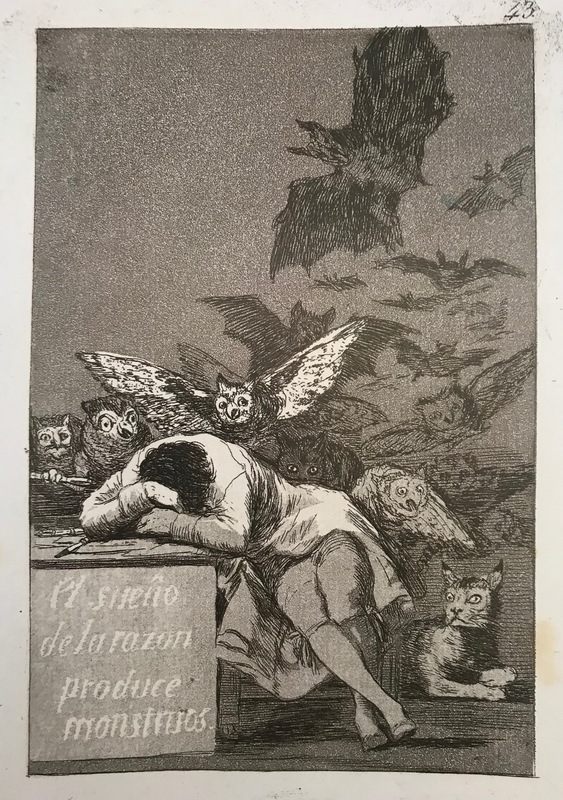 Bearing in mind that the Spanish word sueño can mean both ‘dream’ and ‘sleep’, this means ‘the dream/sleep of reason produces monsters,’ but generally this double meaning has been ignored by scholars. He feels that dreams are an important source of Goya’s inspiration, as they were with Dalí, but they have to be considered in the light of the tradition that distinguishes between deceptive and true dreams (page 131). 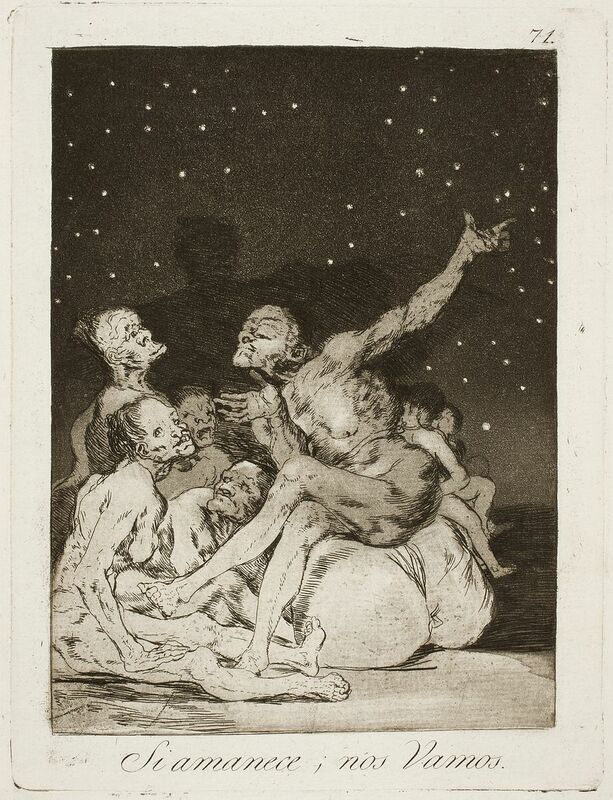 ‘What then,’ Hofman asks, ‘were Goya’s dreams – the benevolent, helpful dreams, or the oppressive variety?’ Is there a realm in-between? 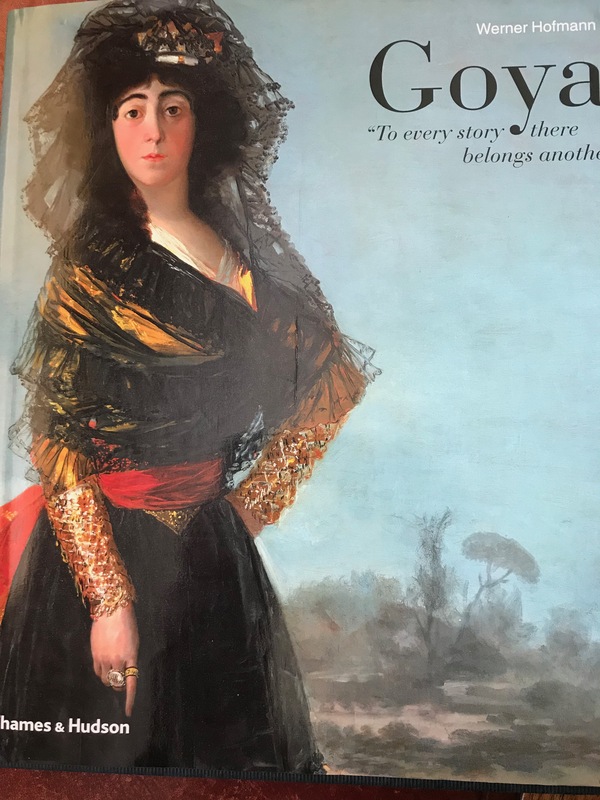 Light and dark enter into a symbiotic relationship, which is difficult and fundamental to Goya’s art: between concealing and revealing, between masking and unmasking. Bearing all that in mind let’s plunge in.
. . . they represent a seamless interweaving of transient reality… and wild dreams which emanate from the imagination. Baudelaire was particularly impressed by Goya’s artistic control, which enabled him to bind heterogeneous elements together and to accommodate the absurd and the monstrous within the everyday spectrum of human life. Goya argued that (pages 95-96)’ it is as proper for painting to criticize human error and vice as for poetry and prose to do so,’ though he felt this should be directed at a general level rather than at specific people as targets. 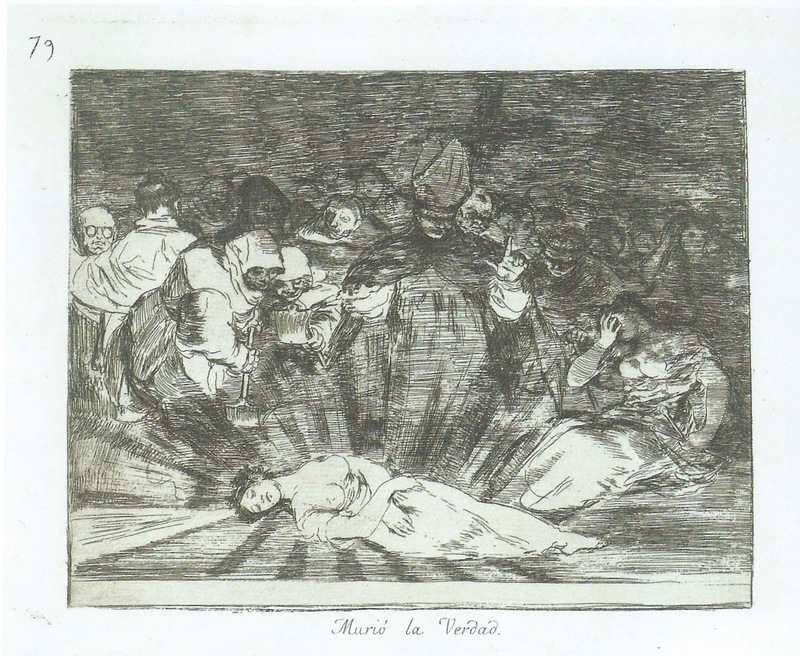 He ended his attempt to sell these images and went into hiding to escape La Santa– the Inquisition. Out of 300 sets only 27 were sold. He brings [imagined monsters] back into the prison of human vice: And Still They Don’t Go! (Capricho 59). An emaciated, naked man is trying to hold up a gigantic slab. Those who remember the horrors of the extermination camps, or who are still living today under the iron fist of oppressive regimes, will recognize the despair and the helplessness conveyed by this scene. ‘Fantasy, having been abandoned by reason, brings forth impossible monsters. This echoes a poet we are moving on to in a moment, of whom Johnson said he yoked disparate ideas by violence together. Goya did something similar by bringing such incongruous elements together in his caprichos. He wanted to transplant his inventions from fiction into reality, to endow them with convincingly realistic features that would distinguish them from the impossible forms and reveries . . . regarded as aberrations. Unlike Dalí, he does not seem afraid to risk the condemnation of his society nor does his primary concern appear to be profit. This was definitely the case with his black paintings which enriched the walls of his home and appear never to be have been intended for purchase. Guided by reason, Goya can enter the abyss of irrationality and bring forth monsters in the form of people, animals and hybrids. In other words, he can control and subjugate them with his creative power. I begin to feel we are closing in on a familiar quandary but in somewhat different terrain. 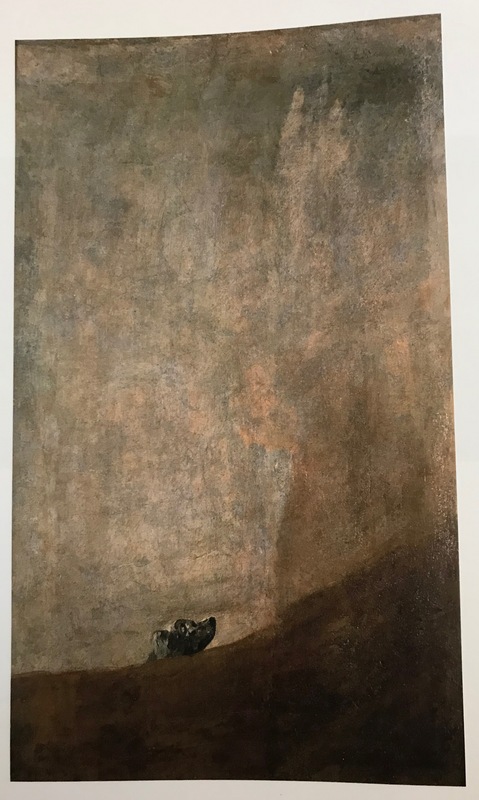 Just as Clare, in his intense observation and idealisation of nature, almost made it a faith, so does Goya seem to do a similar thing in placing his trust in feeling to curb reason in a reciprocally constructive relationship. Just as nature is not God, so neither reason nor feeling nor their combination, as Goya hoped, are in themselves enough to avoid the traps of despotism and deception in the realms of political and domestic power. Goya’s quandary stems from discounting, as Clare also does I feel, a spiritual or transcendent dimension. They try to make either our world, in Clare’s case nature, or our mind, in themselves transcendent, an enterprise that is doomed to failure.
. . . what the people possess and believe to be true is liable to error. For if in proving or disproving a thing a proof drawn from the evidence of the senses is advanced, this criterion is clearly imperfect; if a rational proof is adduced, the same holds true; and likewise if a traditional proof is given. Thus it is clear that man does not possess any criterion of knowledge that can be relied upon. This is what led me to explore, in an earlier sequence of posts, what I called the third ‘I’ – something beyond either reasons or emotion or gut feeling. It would be too much of a diversion to recap that here. For those interested click on these seven links. 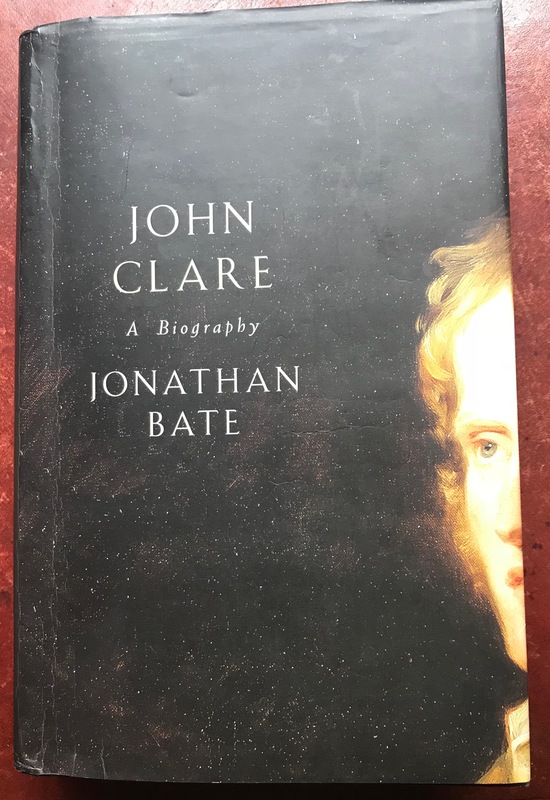 Towards the end of the cruise, I had finished Bate’s book on John Clare. I stared at my modest pile of books on the bedside table before going on deck one morning, wondering which one to take with me. The choice fell between The Islamic Enlightenment and the Norton edition of John Donne. My choice was swayed not so much by which would be the more interesting book but which would be lighter to carry, a surprising factor as I wouldn’t have to carry the book far on board ship and I had no plans to take it on land. Did Donne help me deal with the issue of the need for transcendence? Nature is not enough – despite the almost compelling case mobilised by Bate. Neither is art. 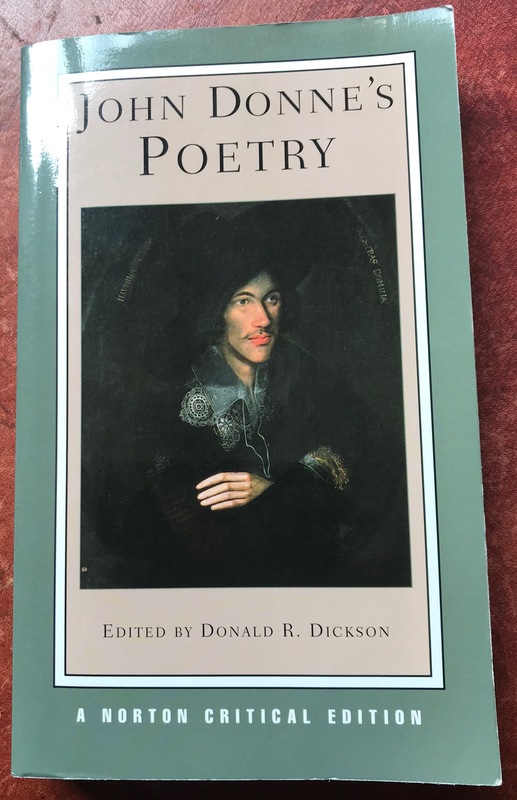 Which is perhaps why I am glad that, towards the end of the cruise I gravitated towards re-reading John Donne and looking at some of the critical comments in the Norton Edition I had taken with me. All the page references below relate to this book unless otherwise stated. 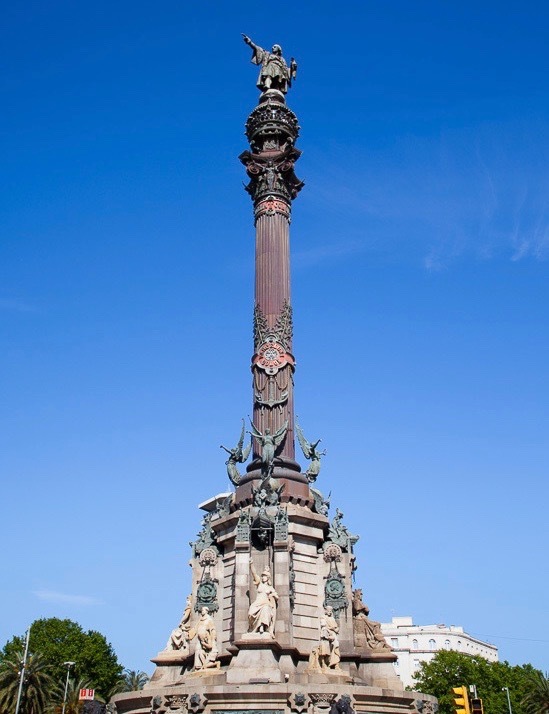 When we were in Barcelona, sharply aware of Spain’s imperial history, we were probably closest to the Spain that got closest to conquering England when Donne was 12 years old in 1588. This conflict between two powerful nations piled further fuel on the fire of religious prejudice already blazing in Elizabethan England. The most heterogeneous ideas are yoked by violence together; their learning instructs, and their subtlety surprises; but the reader commonly thinks his improvement dearly bought, and, though he sometimes admires, is seldom pleased. A different pattern of daring from Goya’s but one that seems to make them kindred spirits in some respects. The poetic evidence of this crisis is Satire III – the great, crucial poem of Donne’s early manhood. . . . a self-lacerating record of that moment which comes in the lives of almost all thinking people when the beliefs of youth, unquestioningly assimilated and bound up with our closest personal attachments, come into conflict with the scepticism of the mature intellect. Though Donne eventually came to accept Anglicanism, he could never believe that he had found in the Church of England the one true church outside which salvation is impossible. To have thought that would have meant consigning his family to damnation. Instead he persuaded himself that the saved would come from all churches. In the third satire Donne refused to defend or reject either Catholicism or the Established Church. He would not abandon the religion of his youth until he had satisfied himself intellectually and morally that it was the right thing to do. The private circulation of the document, Marotti points out, was Donne’s safeguard against dire consequences. So doth, so is Religion. Basically, Donne implicitly believed in a transcendent realm, but the context in which he held that belief was a polarised one. Recall my overall thesis: there is superficial conflict but deep concord between theistic religion and science, but superficial concord and deep conflict between naturalism and science. Most people who have bought into the prevailing myth will have expected the exact opposite and he knows that. Modern Western empirical science originated and flourished in the bosom of Christian theism and originated nowhere else. . . . it was Christian Europe that fostered, promoted, and nourished modern science. . . . This is no accident: there is deep concord between science and theistic belief. I am setting aside something he does not discuss: the debt European science owed to other traditions such as Islam. the fundamental class to which science belongs is that of efforts to discover truths—at any rate it is science so thought of that I mean to deal with here. While it is difficult to give a precise account of this empirical component, it is absolutely crucial to science, and is what distinguishes science from philosophy. God is a knower, and indeed the supreme knower. . . . We human beings, therefore, in being created in his image, can also know much about our world, ourselves, and God himself. God created both us and our world in such a way that there is a certain fit or match between the world and our cognitive faculties. . . . . For science to be successful . . . there must be a match between our cognitive faculties and the world. That match is not at all what we should necessarily expect. The world could just as easily, probably far more easily be an incomprehensible and apparently random puzzle to us, but it is not. This predictability makes successful empiricism possible. It’s an essential part of theistic religion—at any rate Christian theistic religion—to think of God as providentially governing the world in such a way as to provide that kind of stability and regularity. . . . . The world was created in such a way that it displays order and regularity; it isn’t unpredictable, chancy or random. And of course this conviction is what enables and undergirds science. If we see one role of religion as to help us find the Truth, as far as we are able, we have to accept that we will not arrive at the ‘whole truth,’ and probably not achieve ‘nothing but the truth.’ We will only see part of the truth as ‘through a glass darkly.’ The Bahá’í view is that true religion and real science complement each other, and are not contradictory. If the idea of truth as standing on a hill that can be approached from various sides is true for religion, does it also apply to philosophy, art and science? Can each within themselves only see the truth from one angle? Even if we pool them in our consciousness, presumably we are yet again limited by the same constraints, even if the angle becomes somewhat wider. I think it may even go further than this. Michael Pusey I have quoted in a previous post. 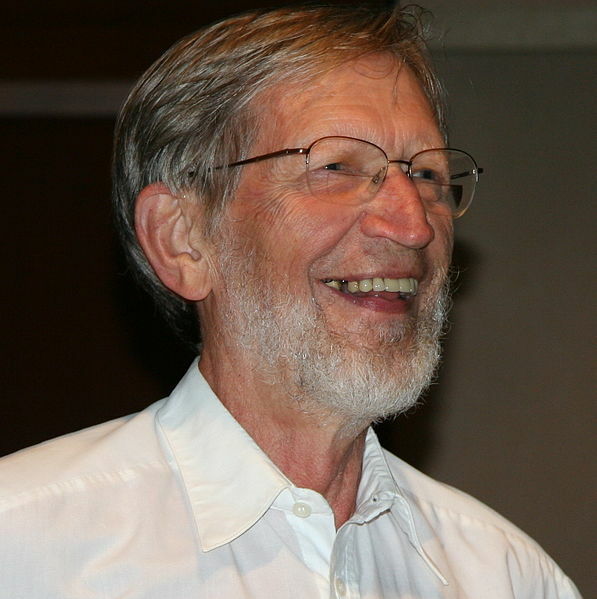 He explains (page 51) that at the threshold of modernity Jurgen Habermas sees three modes of relating to the world becoming increasingly differentiated: there is first the ‘instrumental’ approach, then the ‘ethical’ perspective and thirdly the ‘aesthetic’ take on reality. These need to be in balance and integrated. We have increasingly privileged the instrumental (ends/means or rational/purposive) at the expense of the other two (moral and expressive). This mode has ‘colonised’ what Habermas calls the ‘lifeworld.’ Discourse from the other two positions plays second fiddle to the ‘instrumental’ (sorry! I couldn’t resist the pun!) This impoverishes the decision-making processes of our public lives. Values and subjectivity are seen as second rate, on no objective basis whatsoever. It looks as though we need to add beauty (the aesthetic), practical usefulness (the instrumental) and morality (the ethical) into the mix. How fairly can we expect art of various kinds to blend and integrate all four of these – beauty, usefulness, morality and truth – into a representation of reality? Is this how we should distinguish great from lesser art? I’m entering difficult waters but here goes. What looks beautiful is not always true, and the truth is quite often not even slightly beautiful. Once you begin to factor in the possible need for representations of truth to also capture the good and beautiful we may be asking the impossible. I think Goya in art and, for example, Wilfred Owen in poetry, offer some kind of potential solution. Neither of them shies away from depicting the worst aspects of humanity, but their underlying positive values are still detectable in their way of presenting the unacceptable. It is partly expressed in what I experience as the outrage of the utterance. They neither condone nor capitulate anymore than they mitigate. Something gives them the strength to contain and convey the unendurable. My argument would be that they manage to combine a special kind of haunting beauty with the horror. I think the revulsion I feel is in them and in their art as well, so there is a moral compass orienting their perspective, but it does not preach. Is it useful? I think it is, but not in the simplistic sense of prescribing a clear line of action. It is useful socially and culturally because it does what perhaps nothing else can do as well: in its immediacy and power it can change our consciousness, can help us feel what a soldier feels or a victim of tyranny. It can thereby enable us to resist whatever social forces operate simplistically in those contexts. It can enhance our sense of connection with other creatures and even with the earth itself, in the case of Clare. It can make the world a better place. 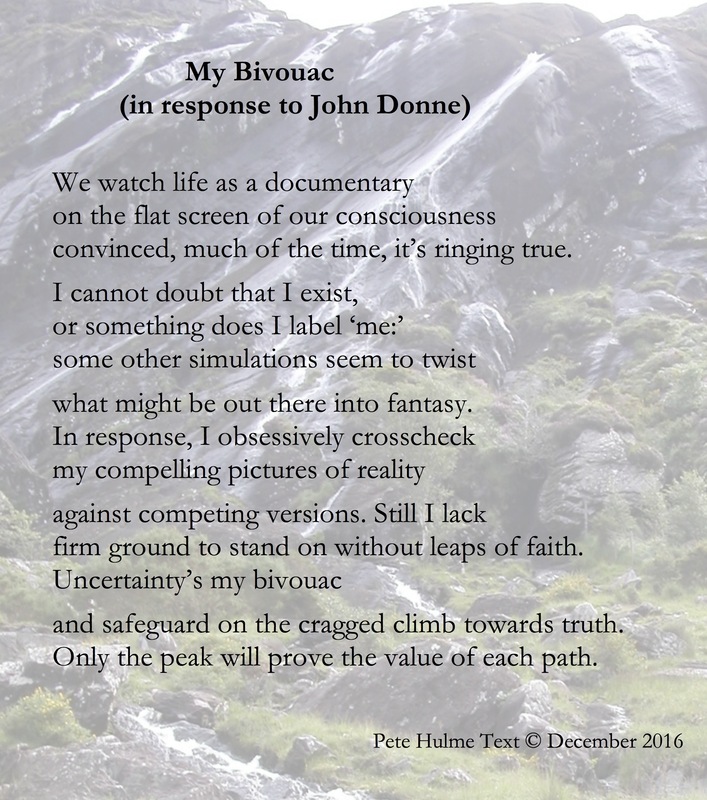 In spite of the doubts expressed in this sequence, I accept that science, technology and the Enlightenment have brought huge material benefits, but as I tried to express in a poem, we’re out of balance. We also always need to recognise that every such advance from fire to atomic power is a double-edged sword and cuts both ways, and we must always therefore be vigilant about the way we use them. Perhaps I’d better leave it there, except to say that the unintended consequence of my failed attempt to escape from the pressures of our complex world has been to help me deepen my understanding of the purpose and potential methods of the arts, something that perhaps the temporary freedom from mundane tasks gave me the space, time and energy to do. Being on a big ship worth millions should, if anything, have sailed me further away from reality into fantasy. I was fortunate that in this case, more by good luck than good management, it did the opposite. This experience has also reinforced something I have always felt. It is impossible to run away from all your problems because you carry most of them in your head. As to your question concerning the meaning of physical suffering and its relation to mental and spiritual healing: Physical pain is a necessary accompaniment of all human existence, and as such is unavoidable. As long as there will be life on earth, there will be also suffering, in various forms and degrees. But suffering, although an inescapable reality, can nevertheless be utilized as a means for the attainment of happiness. . . . Suffering is both a reminder and a guide. It stimulates us to better adapt ourselves to our environmental conditions, and thus leads the way to self-improvement. In every suffering one can find a meaning and a wisdom. But it is not always easy to find the secret of that wisdom. It is sometimes only when all our suffering has passed that we become aware of its usefulness. 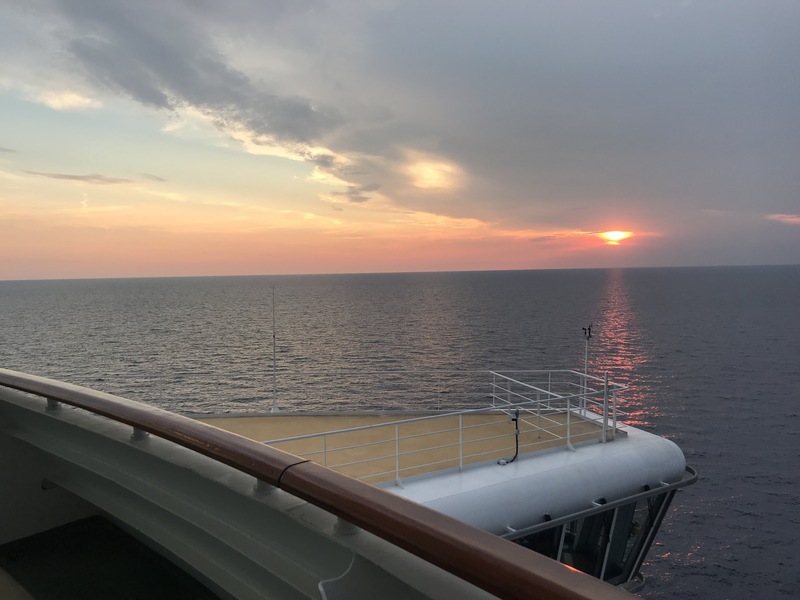 With both my reading and the anxieties about our steward’s missing cousin, the positive side of the experience on board ship was becoming overshadowed by darker realities. 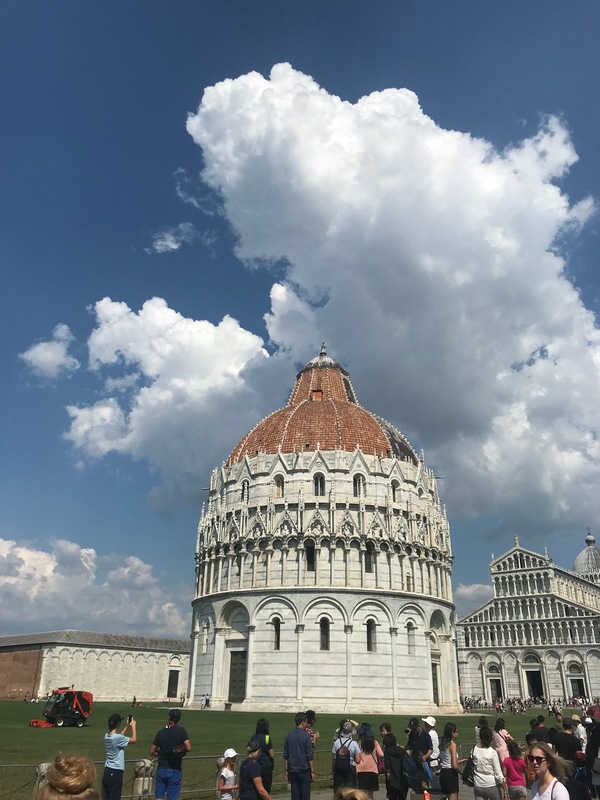 We really needed our excursion into Pisa, not simply to get off the boat but also for the uplifting nature of what we found there, and I’m not talking about the Leaning Tower. We knew that we would not be able to go up the tower anyway. To do that we would have needed to book in advance. However, that was not a problem as there was so much else to see. It was a short drive of 30 minutes from Livorno where our ship had docked. The coach parked in the bus station and the guide escorted us to the Square of Miracles or Cathedral Square. We found the ticket office after retracing our steps the entire length of the square, and booked ourselves to go into the three main buildings in the square: the Baptistry, the Cathedral and the Cemetery, the latter rather unusually being a building enclosing a burial site. 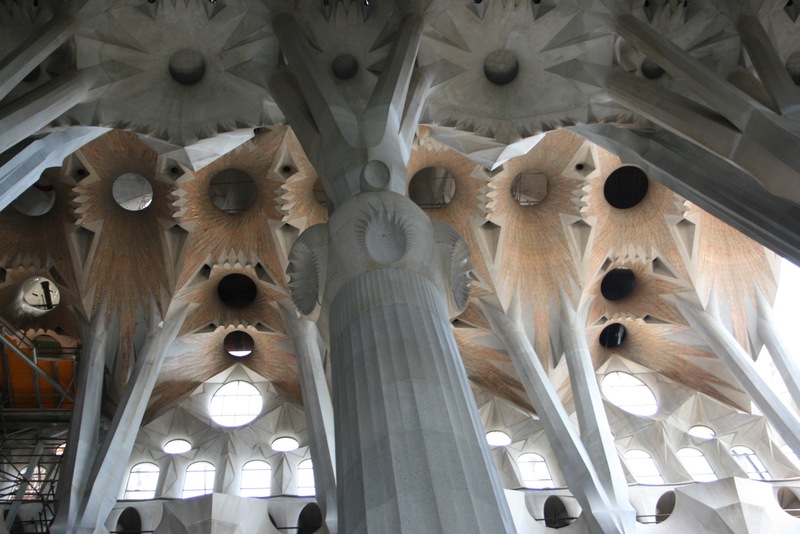 As the tour guide had said en route, those three buildings encapsulated birth, life and death. The tall and circular baptistry was quite a surprise to me. The guide had explained why it was separate from the cathedral. At that period of history in 1363 the belief was that the unbaptized could not enter a church so baptism had to take place somewhere else than the cathedral. Even so, I was puzzled as to why such an extremely lofty space, with its font of octagonal design, should have been constructed for such a simple ceremony. It is apparently the largest baptistry in Italy. Because of the underlying sand, the Baptistry leans 0.6 degrees toward the cathedral – rather appropriate really. 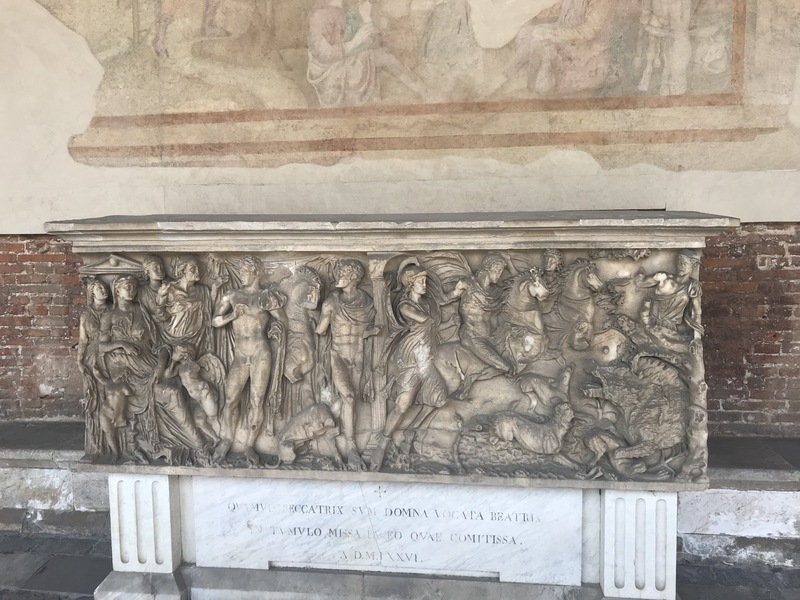 Despite my bafflement, or perhaps partly because of it, the Baptistry was a good preparation for the very different experience of the Cemetery or Campo Santo, its rebuild completed in 1464. 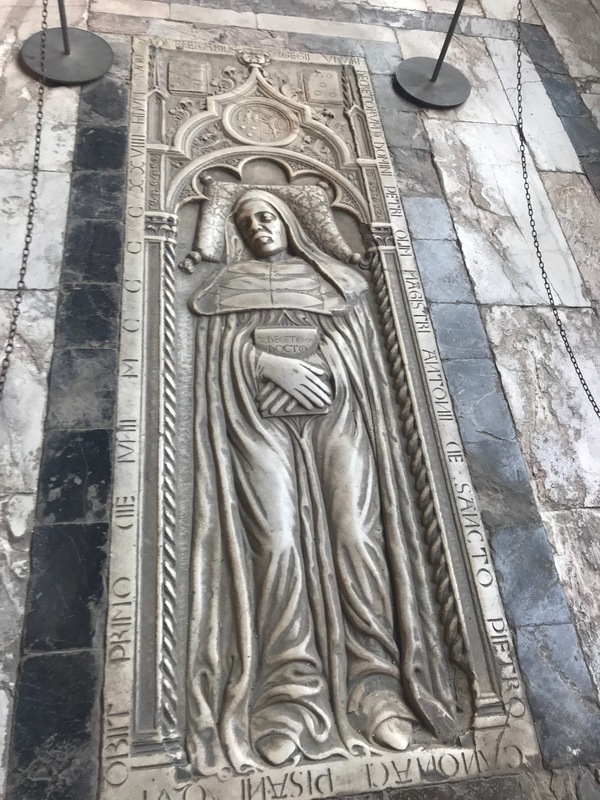 It may seem bizarre to have dislocated the natural order of things by visiting the Cemetery before the Cathedral and immediately after the Baptistry. It seemed to make sense at the time because of the long queue waiting to enter the Cathedral. 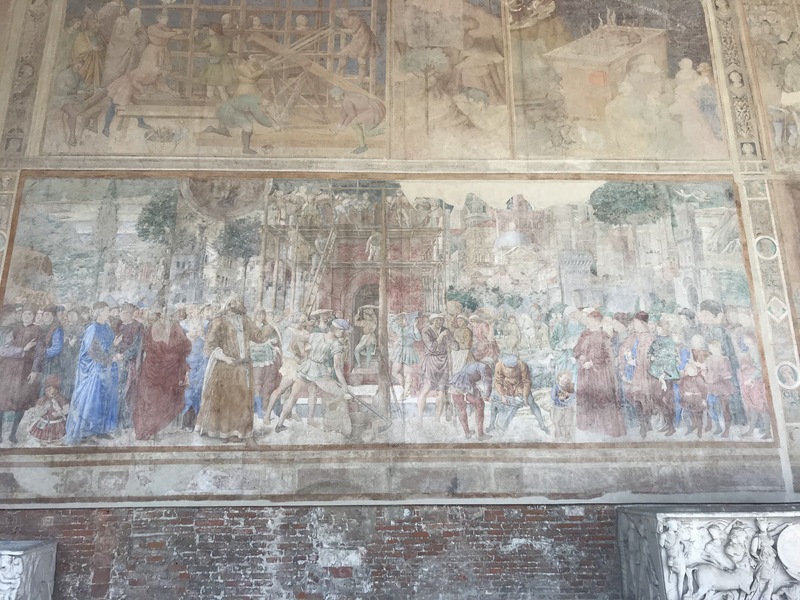 Although the sarcophagi and the stone slabs or plaques marking a grave were striking in themselves, I found myself captivated by the frescos high along the walls. The first had been applied in 1360, the last about three centuries later. On 27 July 1944, a bomb fragment from an Allied raid started a fire.The frescos had had to be removed due to extensive fire damage to the building. They were now in the process of being transferred back into place. Here was yet another complex message about the human predicament. The frescos captured both the faith in Christ of their original creators and a very real sense of the thriving communities that effectively financed and admired them. Their near-destruction captured the fragility and transience of all things, as well as the role in their vulnerability of human discord. The clash of ideologies is still with us and now it has once more a quasi-religious twist reminiscent of what lay in store for England barely 70 years after the Cemetery building had been completed. It was a more subtle message than the amphitheatre’s, but a powerful one none the less. The Cathedral was a more conventionally extravagant celebration of worship and did not detain us long. In fact, the most memorable moment was a friendly exchange with an Indian tourist whose camera fell out of her selfie-stick onto the stone floor. She retrieved it fortunately unharmed. She exchanged some pleasantries with my wife, both clearly pleased to find someone from the same culture in this stridently Christian context. Or perhaps I am reading too much into their instant connection. Anyway, this had been a distinct if brief shift to spirituality, something in short supply on board. On returning to the ship and examining our Horizon bulletin of the next day’s events, we saw there’d be a talk on Dalí, some of whose prints were on exhibition in the gallery. That evening we were glad to hear that our steward’s uncle had let him know that his cousin had been found. He had taken safe refuge in a friend’s house and was alive and well. Feeling lighter in heart we took to our beds looking forward to hearing more about Dali after breakfast. The most intriguing fact that came out of the Dalí talk was that he was told by his parents and came to believe that he was the reincarnation of his brother, who died before he was born. I suppose it would intrigue me as I was in a way a replacement for my dead sister, Mary. Too much of that already on this blog. Other details were less compelling. He met Picasso through Miró and copied his moustache from Valázquez. More illuminating was Dalí’s explanation for his bent clocks. They were apparently inspired by the sight of a melting Camembert, not, as many critics have supposed, by the abstruse metaphysics of time’s recently discovered relativity. We were pleased to learn that the Dalí prints would be on exhibition in the gallery the following day. This was to add another world to my growing list. I’d so far gone from the landscape of Clare through the ‘archaeoscape’ of the amphitheatre to the townscape of Lowry: now was to be the turn of a dreamscape, with associations to one of my favourite artists of all time. 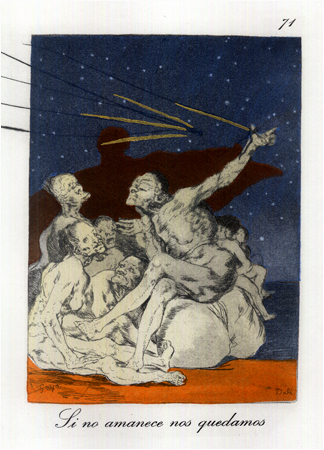 I was about to encounter prints of three tributes from among many that Dalí had paid to Goya. I just can’t rate Picasso, whom Dalí had met, as highly as I rate Goya, mainly because the ego is still too obvious in most of his art, as was also the case, I feel, with Dalí. However, I need to acknowledge that Dalí was the bridge on this ship between Goya and me, and triggered some further mind-expanding processes. 227 years after the birth of Spanish master Francisco Goya, Salvador Dali had an idea to transform Goya’s ‘Los Caprichos’ and present a new work. Goya’s ‘Los Caprichos’ was an artistic experiment exposing the foolish superstitions in 18th century Spanish society. Goya described the series as depicting ‘the innumerable foibles and follies to be found in any civilized society, and from the common prejudices and deceitful practices which custom, ignorance, or self-interest have made usual’. The body of work was withdrawn from public sale before their planned release in 1799. Only a formal order from King Carlos IV kept Goya from being called before the Spanish Inquisition. In 1973 Salvador Dali created a metamorphosis of Goya’s suite into a colourful surrealist masterpiece. Between 1936 and 1939, Spain was going through a civil war with many artists taking sides or going into exile. In 1948 Dalí and Gala, his wife, moved back into their house in Port Lligat, on the coast near Cadaqués. For the next three decades, he would spend most of his time there painting, taking time off and spending winters with his wife in Paris and New York. His acceptance and implicit embrace of Franco’s dictatorship were strongly disapproved of by other Spanish artists and intellectuals who remained in exile. In 1968, Dalí had bought a castle in Púbol for Gala; and starting in 1971 she would retreat there alone for weeks at a time. By Dalí’s own admission, he had agreed not to go there without written permission from his wife. His fears of abandonment and estrangement from his longtime artistic muse contributed to depression and failing health. Franco died in November 1975. Dalí’s surrealist version of Goya’s caprichos falls between Gala’s withdrawal and Franco’s death. When we visited the gallery my attention was held longest on one etching print in particular. This is the picture at the head of this post: Si no amanece nos quedamos. Goya’s original is rather different: Si Amenece nos vamos. As I stood before the image in the gallery the first thought that came to mind was of refugees. I thought of traumatised Syrian and Rohingya families fleeing their homeland in desperation. In terms of the original image that Goya created I was probably post-dating it, getting confused with his black paintings, created some 20 years later, after the war with Napoleon, and with Dalí I was taking it back in time to the horrors of the Civil War. The lady in charge of the gallery came up as I was digesting these slightly inaccurate implications. ‘You’re interested in that one?’ she enquired. ‘Plus ça change, plus c’est la meme chose, in a way,’ I replied, catching myself feeling slightly pretentious. It was slowly dawning on me that, although I was standing in what called itself a gallery, it was really a shop. Art has been a commodity since somebody somewhere at some point in history bought the first picture. Nature became one in a big way for certain with the Enlightenment, and without the technological advances which that brought with it, I would not have been on board this ship standing in front of this print. The pains John Clare endured from Enclosure were only a sign of worse things to come. ‘Did the benefits outweigh the costs?’ I found myself asking myself, as we walked away. I apologise for the poor quality of the versions of these pictures. They’re the best I can find that I feel free to use. I felt it would be useful to pause a moment and reflect on them. Basically, the figures seem much the same. 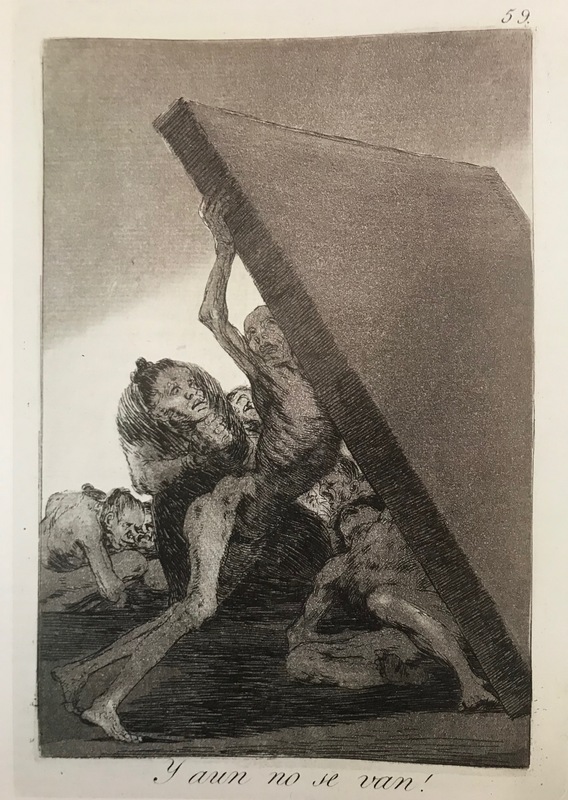 Given that Dalí lived in Spain, seemingly complicit with the rule of Franco, it is hard to be sure what he was intending when he revisited Goya’s Caprichos in 1973. Was it only the dream element and not the political that appealed to him? We have only the change of title to go on, in this case. No dawn for Dalí means staying put, while the dawn for Goya means leaving. I can only guess at what the different implications might be. Dalí’s suggests pessimism and passivity, whereas Goya’s implies hope and action. This conveys to me that it is more dream than politics which stands behind Dalí’s work, whereas, for reasons I’ll go into later, Goya’s work is more a dynamic fusion of the two. Later, I was prompted to look at the life of a poet who took the drastic step of abandoning the religion of his entire family. Whether he did this to avoid execution and to obtain preferment, or out of genuine conviction even at the risk of possible eternal damnation, is a moot point. To be fair, it is perhaps equally difficult to be sure of Dalí’s motives. In the end though the main point is that this etching sent me back to Goya and a comparison of those other parts of Dalí’s sequence I’ve just mentioned, something I obviously wasn’t able to do till I got back home. None the less it is a legacy of the cruise and therefore an extension of that experience. The echoes evoked by Dalí may seem from the outside to have spoiled my experience of the cruise even further, but in fact they enriched it. I benefited immensely from my encounter with the Goya/Dalí blend, in fact as much as I did from the sunsets and far more than from the dance floor or the black-tie dinners. Incidentally, we did go back to the gallery for the special viewing, just to see a fifth print unveiled. 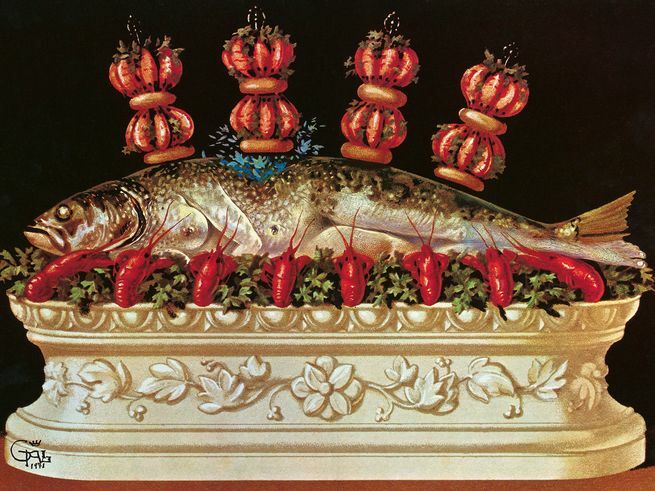 It depicted what at first looked like a fish skewered for dinner above a serving dish that looked like a sarcophagus: on closer inspection it was a woman/mermaid – a characteristic product from within the Dalí dreamscape and definitely without a trace of politics that I could detect. This fall, Taschen published a handsome facsimile edition of Les Diners de Gala, a cookbook the artist wrote in 1973 [Apparently the same year as his tribute to Goya’s Caprichos]. Named after his wife, also a legendary gourmand, it’s one of the most unusual recipe books ever created, a bit like Escoffier on acid. Today, signed copies sell for as much as $25,000. I once sat at the New York Public Library for hours, flipping through Dalí’s illustrations of dishes and meals in a kind of terrified thrall. Crayfish towers are topped with the torso of Joan of Arc, her amputated arms gushing blood. Chickens are trussed with barbed wire. A swan, its head chock-full of human teeth, is served on a pastry dish. Dalí is there, too, pictured at the swanky Parisian restaurant Maxim’s, wearing a plush velvet suit, holding a golden scepter, surrounded by a Rabelaisian feast of his own devising. It was not long before a photo-shoot took place with the gallery director and the proud purchaser of the print standing on either side of it as the cruise photographer recorded the moment for promotional posterity. Dalí seems to have been in his element as a commodifier of his art, an unenviable skill that escaped Goya when he attempted to sell his Caprichos. That’s one of the reasons why I feel his ego compromised his art. Possibly significantly, my only way of tracing the images we’d seen in the gallery was via sites which involved selling something. The sites I tried which were more focused on art in a slightly purer sense contained not a hint about them. I’m trying hard not to read too much into that. Next time I will examine a key figure in art that the prints of Dalí in the cruise ship’s gallery pointed me towards. No prizes for guessing who. I recently have a short talk at the Birmingham Interfaith. It seemed worth sharing here as it relates to the current sequence. Ever since I studied English Literature, and long before I eventually specialised in psychology or discovered the Bahá’í Faith, the words of a poet-priest from the Elizabethan period have stuck in my mind. He wrote those words, part of the third of his five satires, during what must have been an agonising period of his life, when he was deciding to abandon the Roman Catholic faith, for which members of his family had died, and become an apostate. By taking this step, he avoided torture and execution and gained a career at the possible cost, in his mind, of eternal damnation. While the Western world feels it has moved on from such ferocious divisions, the same does not seem to be true everywhere. Also, we should not perhaps feel we are completely free from milder variations of religious intolerance here. This means that Donne’s message is still relevant. The most obvious implication of what he says here is that we have to work hard to find Truth. However, there are other equally important implications, and one of them in particular is crucial to the work of the Interfaith and makes a core aspect of the Bahá’í path particularly relevant for us in our relations both between ourselves and with the wider community. Within the interfaith, we are all, in a sense, approaching Truth from different sides of this same mountain. Just because your path looks somewhat different from mine in some respects, it does not mean that, as long as you are moving upwards, yours is any less viable than mine as a way to arrive at the truth. It is clear, if this is as true as I think it is, that we would all move faster upwards if we were able to compare notes humbly and carefully. I think an aspect of the Bahá’í path is particularly useful for this purpose. It stems partly from our core beliefs that all the great world religions are in essence one at the spiritual level, coming as they do from the same divine source, and that all of humanity is one at this spiritual level, not just at the level of our increasingly global material connections. It’s perhaps important to clarify that the unity He describes is inclusive of diversity: it does not mean uniformity. So, there will be cultural differences affecting our perspectives, creating a need to reconcile them if problems are to be solved. This radical concept of oneness and interconnectedness is at the root of two Bahá’í practices that relate to our ability to work together in a way that transcends our differences. The skills appealed to me deeply as a way of enriching my therapeutic work with people whose perspectives on life were causing them painful problems. One practice is shared by just about every religious tradition to some extent, and perhaps most extensively by Buddhism, which has the longest and richest tradition in this area. This is termed reflection, meditation or contemplation in the Bahá’í Writings. There is one particular fruit of the meditative process that is most relevant here. This spiritual skill or discipline helps create the necessary detachment and humility for true consultation to take place, because we are able to step back and withdraw our identification from our thoughts and ideas sufficiently to listen sympathetically and open-mindedly to what others are saying. The simplest way of explaining my understanding of what this involves is to use the image of consciousness, or in ‘Abdu’l-Bahá’s terms ‘the meditative faculty,’ as a mirror. At one level the mind simply captures as best it can what it experiences just as a mirror captures what’s in front of it. A deeper implication is that, just as the mirror is not what it reflects but the capacity to reflect, our consciousness is not the same as its contents. To recognize this and develop the capacity to withdraw our identification with the contents of our consciousness, whether these be thoughts, feelings, sensations, or plans, enables us to consult with others effectively and reflect upon, as in ‘think about,’ our experiences, ideas and self-concepts. Once we can do this it becomes easier to change them if they are damaging us or other people. Acquiring this skill is not easy. 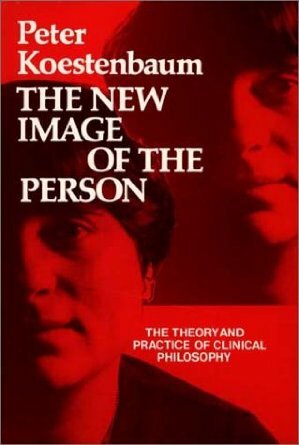 An existential philosopher called Koestenbaum expresses it very clearly in his book The New Image of the Person: The Theory and Practice of Clinical Philosophy. [a]nxiety and physical pain are often our experience of the resistances against the act of reflection. But overcoming this resistance is difficult. It hurts and frightens us. How are we to do it? True reflection at the very deepest level, it seems to me, has to ultimately depend therefore upon the degree of our reliance upon God, but can also be achieved to some degree by disciplined practice alone.
. . . releases consciousness from its objects and gives us the opportunity to experience our conscious inwardness in all its purity. The name Western Civilisation has given to . . . the extreme inward region of consciousness is God. Reading Koestenbaum has helped to deepen my understanding of this concept. This process of reflection, and the detachment it creates and upon which the growth of a deeper capacity to reflect depends, are more a process than an end-state at least in this life. In developing that capacity we will have to strive for perfection and be content with progress, as the saying goes. As a process within the individual, it is complemented by and interacts with the process of consultation, as we will now explore. Once we can reflect, we can then consult. Interestingly I see this as a two-way street. Just as reflecting more skilfully makes for better consultation, so does striving to consult properly enhance our ability to reflect. And consultation makes the creative comparison of paths and perspectives possible, as we will see. As far as I am aware no tradition other than the Bahá’í Writings makes this link between these two skills so clearly nor emphasises so strongly the need for consultation as a dissolver of differences and enhancer of understanding both at a practical and a theoretical level. Why is all this so important? Debate, propaganda, the adversarial method, the entire apparatus of partisanship that have long been such familiar features of collective action are all fundamentally harmful to its purpose: that is, arriving at a consensus about the truth of a given situation and the wisest choice of action among the options open at any given moment. 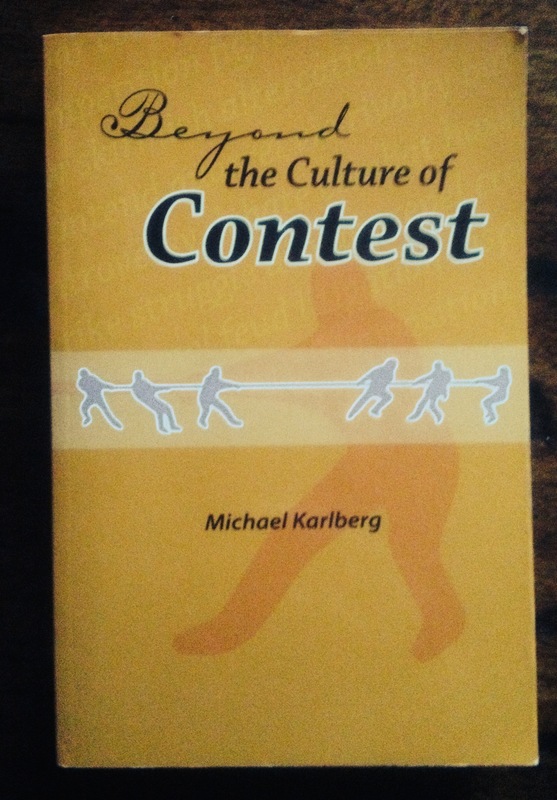 Karlberg, in his book Beyond a Culture of Contest, makes the compelling point that for the most part our culture’s processes are adversarial: our economic system is based on competition, our political system is split by contesting parties and our court rooms decide who has won in the battle between defence and prosecution, rather than on the basis of an careful and dispassionate exploration of the truth. The French courtroom is, apparently, one of the few exceptions. Bahá’ís assert that ever-increasing levels of interdependence within and between societies are compelling us to learn and exercise the powers of collective decision-making and collective action, born out of a recognition of our organic unity as a species. It isn’t too difficult to see how all this might be applied to our interfaith work. [C]onsultation is the tool that enables a collective investigation of reality in order to search for truth and achieve a consensus of understanding in order to determine the best practical course of action to follow.… [C]onsultation serves to assess needs, apply principles, and make judgements in a manner suited to a particular context. Consultation is therefore, the practical, dialogical means of continually adjusting relationships that govern power, and, thus, to strive for justice and unity. So, exactly what is this consultation? today’s formulation, no matter how useful, may be out-of-date by tomorrow. Only its proper use can be guaranteed to transcend differences and discover the most effective and constructive lines of action. The unity we all both desire and need is an ideal that may not be possible without true consultation, which is a spiritual discipline not easily or cheaply achieved. Hopefully we can all agree that these concepts constitute fruitful food for thought, or do I really mean reflection?
. ‘Abdu’l-Bahá:Paris Talks(Bahá’í Publishing Trust UK – pages 173-176).
. `Abdu’l-Bahá, cited in a letter dated 5 March 1922 written by Shoghi Effendi to the Bahá’ís of the United States and Canada, published in “Bahá’í Administration: Selected Messages 1922-1932”, pages 21-22.
. ‘Abdu’l-Bahá in Selections from the Writings of ‘Abdu’l-Bahá –number 43. 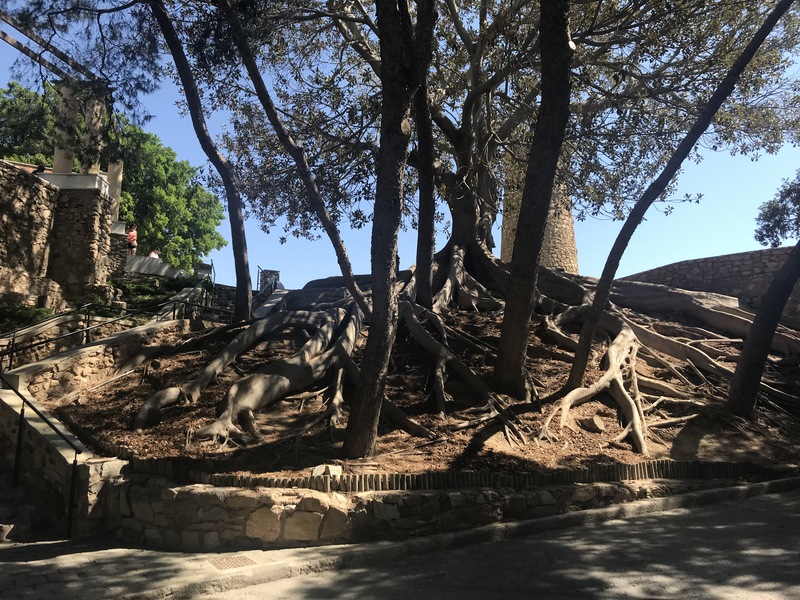 A Mediterranean Cruise (3/5): Is poetry a song of the earth? Nature in its essence is the embodiment of My Name, the Maker, the Creator. Its manifestations are diversified by varying causes, and in this diversity there are signs for men of discernment. Nature is God’s Will and is its expression in and through the contingent world. Once on board, each night before I slept I read at least 50 pages of Bate’s biography of Clare. This was usually after spending an hour or two on one of the decks watching the sunset and looking out for dolphins. I hoped it would help me get a better grip on what Bate’s had meant by poetry being the song of the earth. Eventually, I’d settle down with my book, faintly conscious of the slight swaying of the ship and the constant grumble of the engine. Bate’s compassionate account of Clare’s troubled existence brings to life some of the more abstract aspects of man’s exploitation of nature. Clare was both deeply connected from childhood with the nature around him and forcibly cut off from it first by the Enclosure Movement, then by an enforced move from his birth home to one he experienced as every different and finally by his incarceration in an asylum. All these dislocations were further confounded by his success as a poet, where his experience of London changed him radically. Enclosure was… symbolic of the destruction of an ancient birthright based on cooperation and common rights. The chance of Clare’s time and place of birth gave him an exceptional insight into this changed world. This was because a high proportion of local villagers held common rights, an unusually large area of the parish was heathland, and the open fields survived until an unusually late date.
. . . though he professed himself an Anglican, Clare’s attendance at church was mostly irregular. His deepest feelings of a religious kind were reserved for his experience of nature and his memories of childhood innocence and joy. I was really looking forward to learning more, though I knew that Clare’s life had a tragic trajectory, ending as it did in an asylum over almost his last two decades.
. . . if someone who had never read – perhaps never even heard of – such nature poets as Thomson, Cowper and Wordsworth nevertheless responded to nature in the same way as they, then there must be ‘universal feelings’ about nature which poetry was but an echo… Clare saw it as his task to write down the poetry that was already there in nature itself. Drury’s faith in the potential of Clare’s poetry saved Parker and Ann from the poor-house. After his exposure to fame and London, he could never fully return to his old life. In this sense, his consciousness of a new identity as he sat in the Stamford coach was prophetic. My wife and I were both awake. It was 7.30 am. We groaned and got up grumbling. 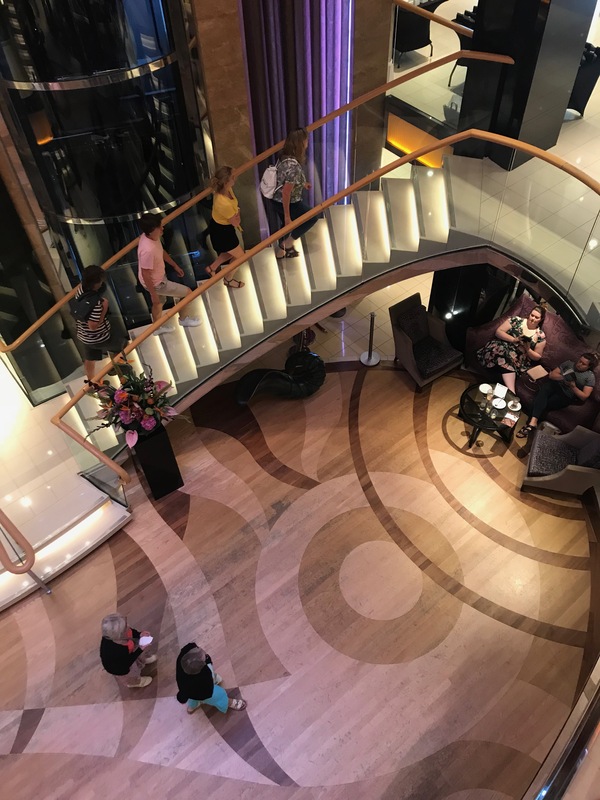 When we were dressed and had left the cabin to head for breakfast at the buffet on Deck 15, we bumped into our steward in the narrow corridor outside our room. Standing by the trolley piled high with towels and bedding, he greeted us with his usual friendly smile. We asked him if he knew about the recent earthquake. He didn’t. We apologised for worrying him but explained that we were concerned to know whether his family were all OK. He was clearly concerned. He explained that he would not be able to find out yet but hoped to get in touch with family later in the day. We parted without our usual exchange of joking comments. En route to the buffet we picked up our newsletter and puzzles. 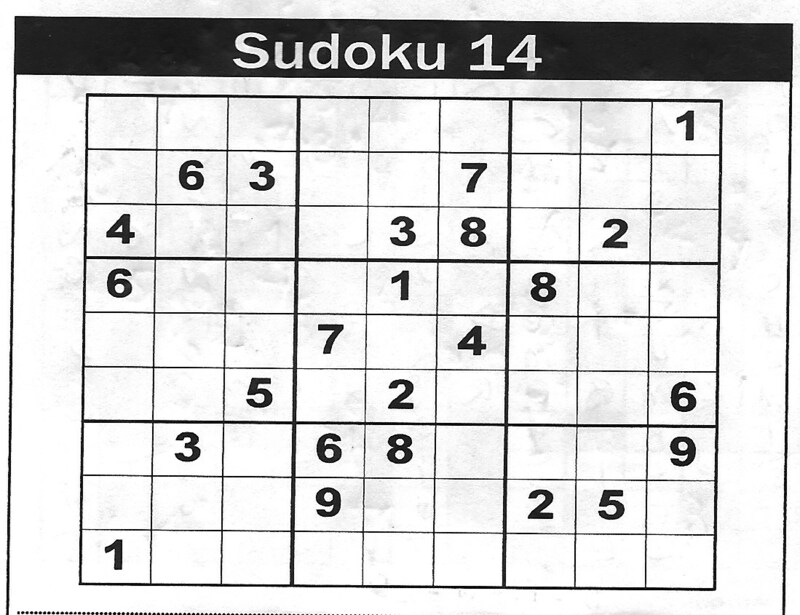 The puzzle sheet had a fairly demanding Sudoku on one side and ridiculously easy crossword on the other. The newssheet was based generally on yesterday’s news and was only worth picking up if we’d missed Sky news the night before. Horizon was a more valuable read. It told us what would be happening the following day and was left in our cabin the evening before. On this occasion, over my usual breakfast of oats, raisins and milk plus a slice of toast and for once marmalade, we looked at the day’s events and spotted a talk on Lowry, a joint favourite, in the theatre. As we both knew a fair bit about the artist from reading his biography and going to see his paintings at Salford Quays, we decided to give the talk a miss but to go to the gallery where some prints were on show. This was probably a wise decision given the delay caused by having to queue for clean teacups at the buffet. We would’ve missed the start of the talk anyway. As it was there was only one print that caught our attention: The Brothers. I don’t have a copy of that in my Shelley Rohde’s biography, nor have I ever seen the original anywhere. Its impact was quite intense. The way the brothers overlap in the print conveys the strong sense of a symbiotic relationship. Their merged black hats make them seem almost like twins joined at the head. The colour of the arch overhead matches their coats and, along with the narrowness of the picture, seems to imply that they are both in some way imprisoned or at least overshadowed by their relationship. 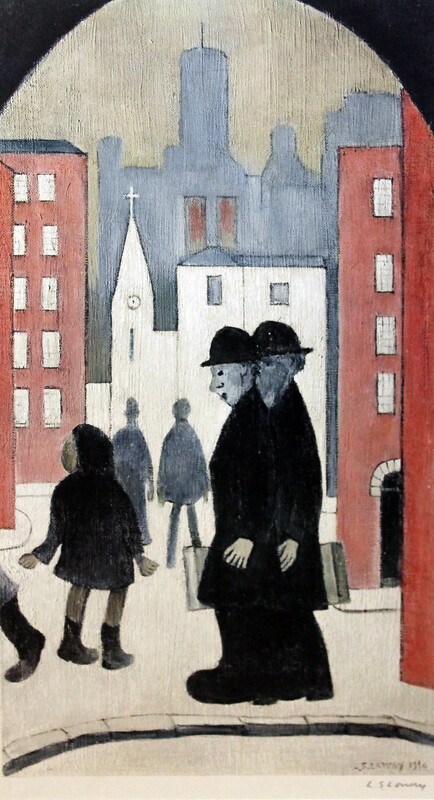 The townscape behind them is unusually constricted for Lowry and the church and flats, if that’s what the red buildings were, would not look out of place in a doll’s house, hinting that, in spite of the greying hair of the background brother, we are not quite in a fully adult world here. Most of Lowry’s work contrasts quite strongly with Clare’s rural home, in which I was so vicariously immersed at the time. His less well-known seascapes, which I first encountered on visiting the Lowry gallery at Salford Quays, added a new dimension to my understanding of his work, and would’ve blended in better with my cruise perhaps if I’d found one of those in the ship’s gallery. I didn’t realise at this point that I would soon be encountering a third very different environment in paint. Blended with the artificial world of the cruise ship, nature, art and town alone began to weave a pattern of insights I haven’t quite digested yet. Part of the pattern is clear. Clare was uprooted from the earth of his childhood with devastating effects on his mental health and an inspiring impact on his poetry. 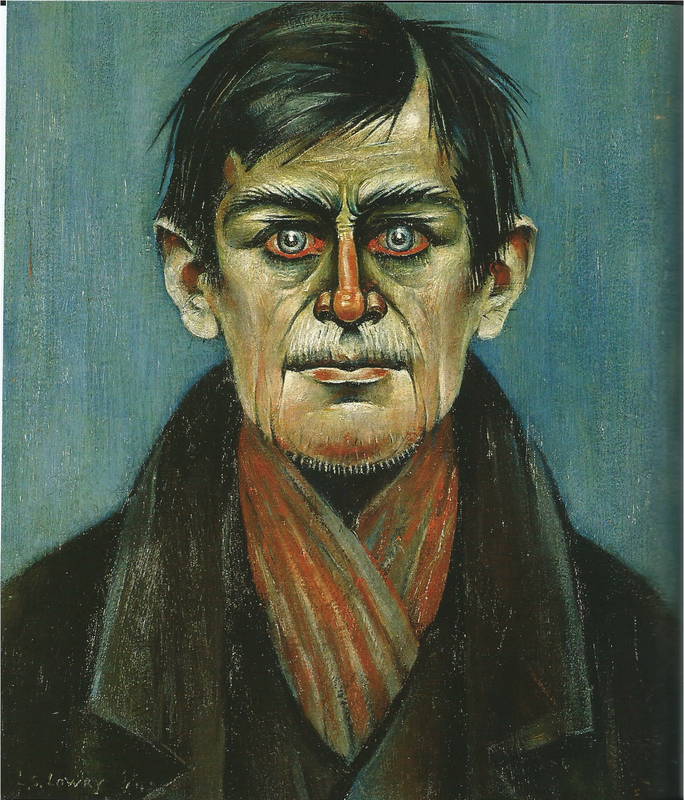 Lowry’s roots were in the Northern townscape, which fed his art but may have starved his emotional life, though his voraciously demanding mother and a possible poorly understood autistic tendency didn’t help. The third world I entered, through prints again, opened up another world altogether, but that will have to wait till next time. Together they illustrate just how complex is the relationship between art, personal life and nature. This idea, that poetry might, at some level, simply be the song of the earth, was seeming slightly fragile. Even Bate, in his biography of Ted Hughes, is clearly aware that poetry comes in many forms. For example (page 93), he describes Yeats as ‘the poet of the land and the spirit of place’ in contrast to Eliot as ‘the poet of deracinated modernity.’ This of course still leaves begging the question of whether a poet who simply ‘gives voice to a new terror: the meaningless’, is a poet in the full sense of the word, no matter how powerful and honest that voice may be. 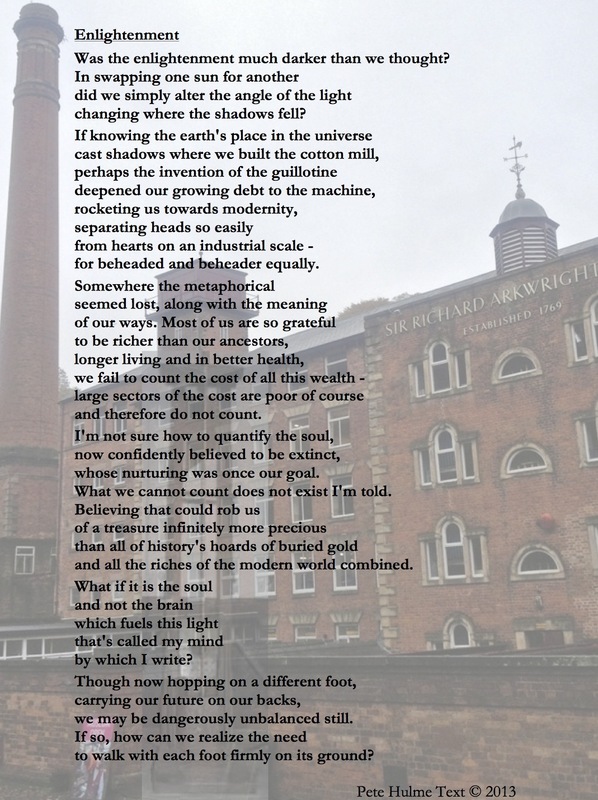 This relates to my struggle, explored in earlier posts, with much modern art, if it seems to capitulate to the dissonance and disbelief of the modern world with no counterbalancing sense of meaning and purpose. Can true poetry be simply nihilistic? Not that I’m saying, as should be clear by now, that poetry is only authentic if it sings about nature. 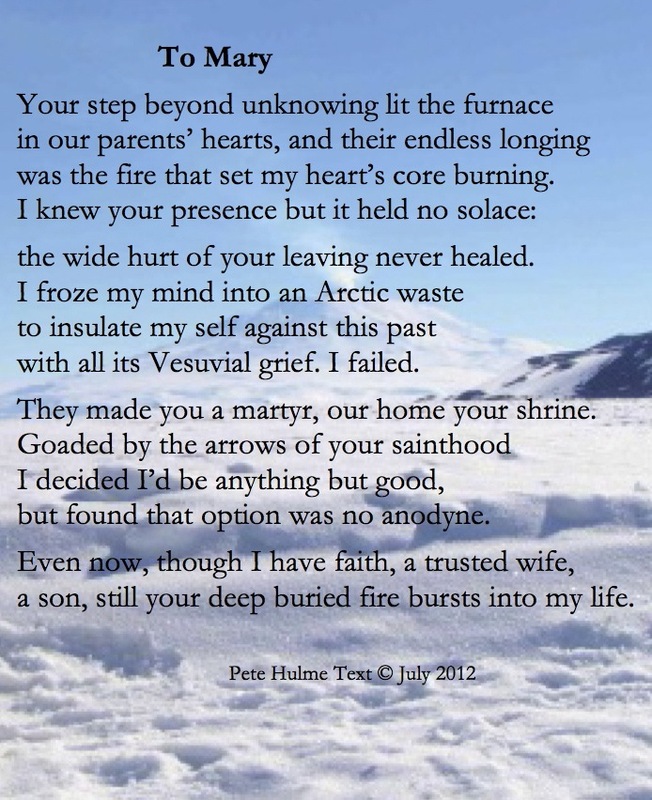 Nature is not the only higher value poetry can draw upon to give it depth. To complete the picture, it might help here to fast-forward to where my reading of Bate’s whole biography of Clare left me. After his brief moment in the spotlight and two less successful collections of what Bate feels were superior poems, Clare’s world was turning significantly darker. Not only was the impact of Enclosure still tightening but his success had brought with it the opportunity to move three miles away to a more spacious home, something which proved a mixed blessing. The changes in the land wrought by enclosure were by now symbolic of his own narrowing prospects and the loss of the familiar landmarks of his childhood. Save in memory and poetry, there was no road back to childhood, to the unenclosed commons, to Eden. As his depression closed in upon him, the only future was alienation. The accommodation was much more spacious than at Helpston… But the village never became home. It felt like a closed community, hostile to newcomers. His remembrance is not just of his old home, but specifically of the pre-enclosure landscape. It was also at this time that he wrote another of his great enclosure elegies, a vigourous poem of political complaint spoken in the very voice of a piece of land, ‘Swordy Well’. . . . With the enclosure, it was taken by the parish overseers as a source of stone for road mending. In the poem, the land speaks out against its own enclosure in the same terms as a labourer would have used to complain about his loss of ancient rights. ‘I ha’n’t a friend in all the place,’ sings the desecrated earth, ‘Save one and he’s away.’ That one is Clare himself, both physically away from Helpston and mentally distant from his own unenclosed youth. I can resonate to this to some degree, as I was transplanted from lower middle class roots at the age of seventeen to the lofty heights of privilege at Cambridge in the early 60s. Since then I have always felt déclassé, belonging neither to my culture of origin nor to the rarified atmosphere of dinner suits and cocktail parties. This may partly account for why I found the cruise concept of ‘black-tie dining’, something that happened on four nights of our journey, a somewhat bizarre experience: I tried it once, in my green suit not a dinner suit, and stuck to the casual dress of the buffet after that. Shudders Hell thro’ all its regions. I was beginning to feel that the motif of the prison was becoming an uncomfortably frequent theme. Clare had coined the term self identity. Now he coins its opposite: sad non-identity. The absence of home and family has stripped Clare of his sense of self. At the same time, the very act of writing is a defiant assertion of the self. ‘At once to be and not to be’ is a breath-taking riposte to Hamlet’s question. Even so, he is able to capture this in powerful poetry that does not completely capitulate to his sense of annihilation. In imagination, even in the asylum, he could complete the circle of vision, undoing his troubles by laying himself to rest between grass and ‘vaulted sky.’ He longs at once for both childhood and the grave. The horizon was a point of order for landscape painters like Church. For poets like Dickinson, it was the point of fusion of this world and the next. Maybe though for Clare, even though poetry began as a song of the earth, in the end it was more than that. I’m not sure I can quite find words right now for what that means. All I can say at the moment is that poetry itself can be a kind of transcendence, that brings meaning, perhaps even consolation, into the darkest moments of our lives. When we spoke to our steward later that day to check how things were back home, he looked quite worried and told us that his cousin was missing, but the rest of his family were thankfully OK. We commiserated with him and assured him that we would remember his family in our prayers and hope that all would be well.
. It would be fascinating to explore this further here but the post is long enough already. For now it is enough to indicate that R B Martin’s biography of Hopkin’s suggests (page 268) that an enforced move from St Beuno’s in rural Wales, where he had been studying for the priesthood, may have accounted in part for this sense of (page 264) ‘limitation, entrapment, a kind of stifling imprisonment of the spirit.’ The intensity of his connection with nature (page 203) would be more than enough to suggest a close affinity with Clare at least in this respect, and a comparable reaction to being torn away from nature by his move. Humanity’s crying need . . . . . calls, rather, for a fundamental change of consciousness, for a wholehearted embrace of Bahá’u’lláh’s teaching that the time has come when each human being on earth must learn to accept responsibility for the welfare of the entire human family. This seems worth republishing at this point, given its relevance to nature as an issue in the current sequence. I had a recent deep discussion with an old friend (of course, I mean old in the sense of ‘known a long time.’) We are close in many ways. We share a similar sense of humour and many core values. However, we are hugely different in our interests – hers practical, mine theoretical – and temperament – she, extravert: me, introvert. She was completely unable to understand how I could combine a deep love of nature with a completely passive attitude to gardening. I gave into the temptation to react, which generally involves treading on dangerous ground and attempted to point out that she similarly fails to understand why I spend so much time and energy reading and writing, even though she values some of the ideas that come out of all that effort. I referred to her passion as horticulture. It’s then that the concept of ‘hearticulture’ came to me in a flash, as a good way of contrasting our intense enthusiasms. This idea has had a long gestation period though. 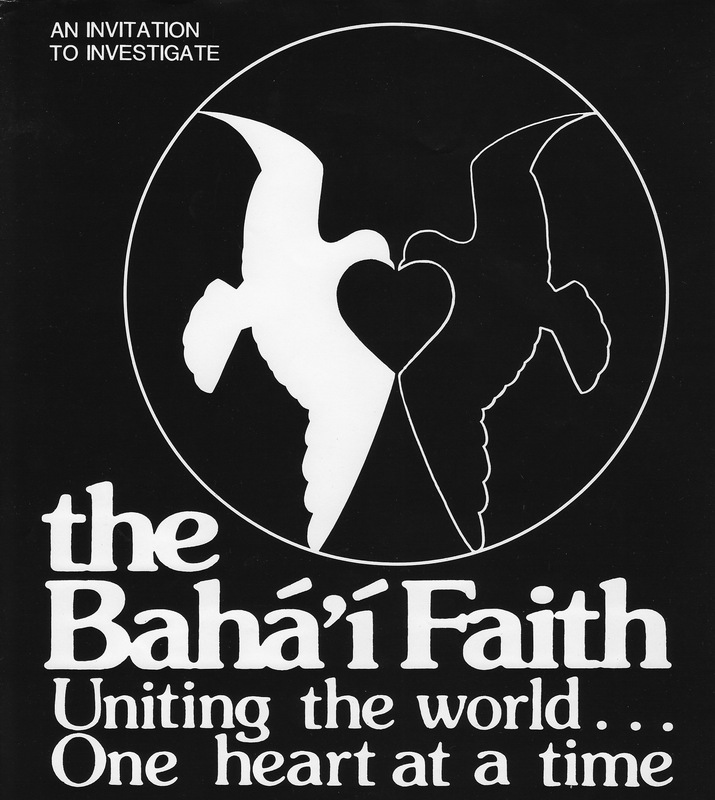 First of all there was the slogan used many years ago in the Bahá’í community ‘Uniting the World: one heart at a time’ with the logo that accompanied it (see picture at the head of this post). I used to joke that this meant we were involved in heart-to-heart resuscitation. Because, to do mind-work, I drew on lots of other disciplines and traditions, including philosophy, psychology, biology, religion (especially Buddhism and the Bahá’í Faith) and the arts, I could sometimes feel like giving myself a fancy title such as psy-culturalist. This captures the richness of the traditions I could draw on and also captures the essential purpose of mind-work which is growth. It also meant I didn’t have to label myself a psychologist with its one-sided implication that I study the mind but don’t work with it, nor did I have to call myself a Clinical Psychologist with its implications of illness and therapy, which are insulting to the client. Psy-culturalist, as a term, has a similar problem to Clinical Psychology. If we think about gardening, it’s a one-way street. Plants, as a general rule, don’t grow people. Mind-work, though, is both reciprocal and reflexive. I grow you and you grow me and we grow ourselves as well! The garden image implies that many of the processes that promote spiritual development have a far slower pace than either light or fire would suggest. The image is also powerfully suggestive of how the processes of spiritual growth are an interaction between what we do and what is accomplished by infinitely greater powers that work invisibly on the garden of the heart over long periods of time. It takes only a few seconds to plant a seed, it takes some degree of patience then to nurture and protect it, but by far the greater determinants of what happens in the end come from the soil, the weather and the sun. When, for example, I read a passage of Scripture I am sowing seeds. When I perform acts of kindness as a result I water that seed. My heart’s garden then benefits with flowers and fruit because of the rich nutrients of the spiritual soil and the energising power of the divine sun. By analogy, these fruits yield further seeds that I can plant if I have the wisdom and caring to do so, and my heart will benefit even further. I know that the term ‘hearticulture’ could still be seen as one-sided. I’m the gardener and you’re the garden. But in terms of the Bahá’í perspective that would be missing a crucial point: I need to tend my heart, you need to tend yours and we can both help each other in this process. We both can help each other develop a growth mindset, to borrow Carol Dweck’s terminology. Once we begin to see what this means, every interaction with another human being, or even with an animal, insect or plant, becomes an opportunity to facilitate our growth and the growth of the being with whom we are interacting. And, what’s just as or even more important, they can facilitate ours. That heart is an anagram of earth just makes the metaphor even more appealing. I have come to realize that hearticulture is my true passion. Everything I do is influenced, perhaps even entirely reducible, to that purpose. I want to understand myself and others better, that’s true, but not just for its own sake, but for the purpose of growth. And if our hearts grow, so will the earth as a whole benefit. When our hearts shrink, the world dies a little. If all our hearts should shrivel completely, the world as we know it would be utterly destroyed. We would wreak such havoc that Hiroshima and Nagasaki would be utterly dwarfed by the consequences. Basically, I have to learn how to expand my heartfelt sense of connectedness so that it embraces the whole earth. I believe that’s what we all need to learn. I want to learn it too, and as fast as I can, but I have discovered over the years that the metaphor of gardening applies here also in a way. I cannot grow faster than the laws of nature and the limitations of my own being allow. To paraphrase a Bahá’í pamphlet on making the equality of men and women a reality, hearticulture will also take love, patience and the passage of frustratingly long spans of time. But that is not a reason not to persist in the attempt. O My servants! Be as resigned and submissive as the earth, that from the soil of your being there may blossom the fragrant, the holy and multicolored hyacinths of My knowledge. My wife and I were sitting reading on the upper deck as the sun slowly sank towards the horizon. The sea was calm. There was a low band of cloud floating just at the bottom of the sky-line. It didn’t look as though we’d get the spectacular fire-forge of a sunset we’d been hoping for. Still, it was pleasant to sit, stroked by a relatively gentle wind, before a sky far wider than we usually enjoyed. 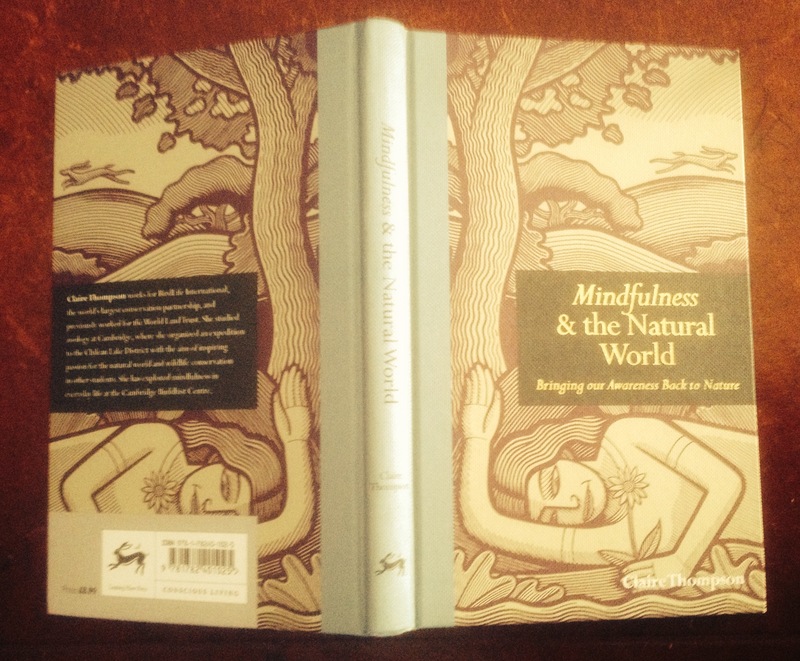 I took out my copy of Mindfulness and the Natural World by Claire Thompson. I had decided to use one of her meditations (page 124) to help me tune in more to nature. ‘Write a list of five things in nature that you noticed that day and feel grateful for.’ I started to work on my list, glancing at the sinking sun as I scoured my memory. 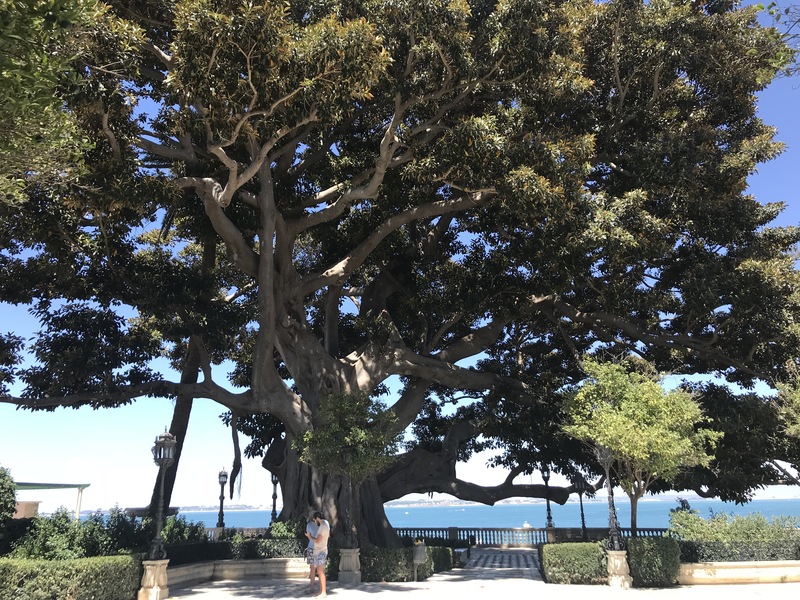 There was the fig tree in the square in Cadiz, at least I think it was a fig tree. The fruit hanging from its branches might have been just a tad too large to be a fig, but I wrote that down anyway. Then there was the old tree in the coastal garden there. We’d been hurrying back to the boat at that point so I didn’t really have time to savour fully the complexity of its system of branches, but the impact it made even so had stuck in my mind. I was beginning to struggle at this point. Clearly my campaign to connect with nature was getting off to a bad start here. As I gazed at the slowly reddening sun, I noticed out of the corner of my eye a woman with an expensive camera leaning over the rail and staring at the water. The melons I had eaten in my fruit salad came to mind for some reason. I wrote it down. That concoction was going to be a regular feature of my on-board diet, though I didn’t know that yet. Gratitude would shift into boredom. Then I remembered the flocks of seagulls swooping down towards the waves as we pulled out of Cádiz. As I worked on remembering another item to make my list of five, and tried to summon up a feeling of gratitude for the experiences I had remembered, the lady with the camera approached. ‘Hallo,’ she said, in a clearly Spanish accent. She gave me her opt-in card. I showed her the page I was working on and what the meditation was about. She expressed polite interest before moving on to the next deck chair. Later, at her talk, we learned, amongst other things, that the Orca, though it is known as the killer whale, is really a dolphin because it has teeth, which whales do not. 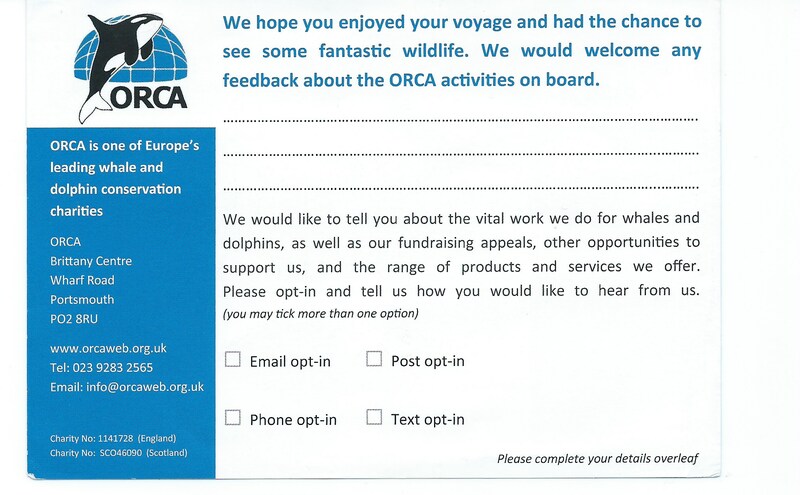 There are 29 species of the whale/dolphin family in the Mediterranean. The tongue of the largest whale is large enough for an African elephant to stand on and its heart is the size of a VW car, apparently. The Orca is more modestly sized as a bus. The sperm whale can hold its breath for two hours. I’m not sure this factual approach was helping me in my efforts to tune in to the natural world. After she walked away, I remembered the pigeons cooling off in the fountain just off the Plaza de España in Cádiz. I was kicking myself for not having taken a photograph. 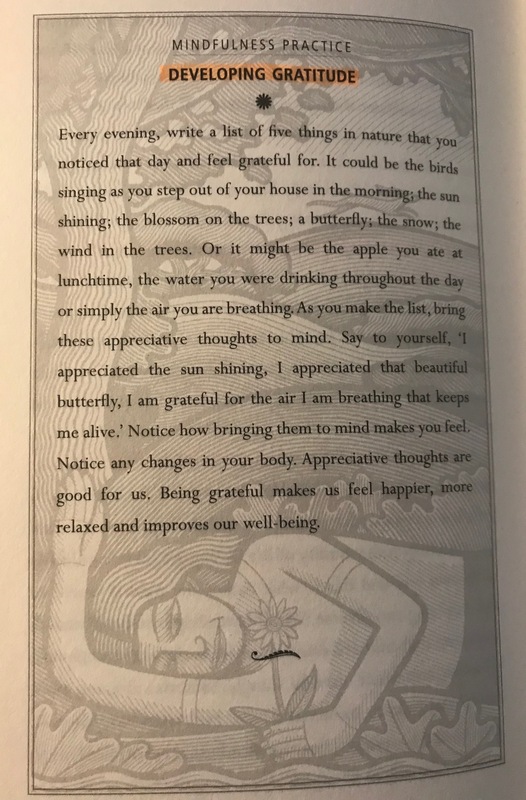 I had a half-hearted attempt to meditate with gratitude on the five things in nature I’d recently noticed, before picking up the book to read some more, glancing at the setting sun as I did so, but failing to wonder why I hadn’t used that in my list instead of the melons. Like our bodies and our senses, our minds came from nature and were shaped by living in the natural world. Although the origins of man’s capacity for empathy was a mystery to Schopenhauer, the teleology was clear. By feeling another’s plight as if it were our own and by extending a hand to comfort and support them in their struggle to persevere and prosper, we recognise the unifying thread that connects each of us to the other and all of life on earth. As I expanded on in that post, my sense is that, sadly, nature alone will not be enough to lift us above our tendencies to self-destruction. Of course, I also accept that some forms of ‘religion’ have led to the opposite problem, an exploitative contempt for nature and recognize that we need to integrate both religion and nature constructively if we are to survive. To live in the realms of our minds and to cling to the idea of a constant separate ‘I’ experiencing our entire lives lies at the heart of most of our unhappiness. He may have disposed of the self in a way that preserves his atheism intact. What he skates over are the implications of the consciousness with which he is left. I can see that we are close to Buddhist ideas of the annihilation of the self as it merges back into the ground of being – blending its drop into the ocean once more. But there’s a catch, isn’t there? There is still some kind of consciousness albeit without the usual boundaries. 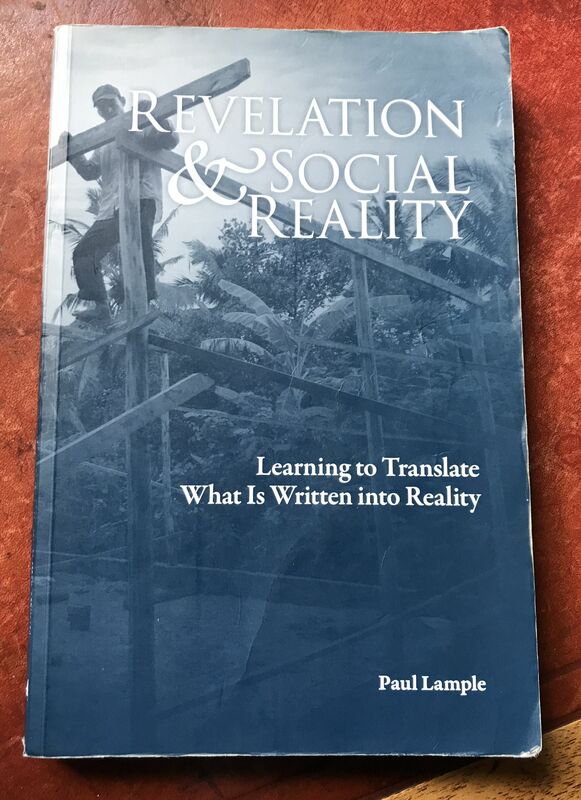 There is still an awareness with which he is connected and whose experience he remembers even if he cannot sustain that kind of awareness for long. I put the book down again and picked up that day’s Sudoku puzzle, something the cruise printed off every morning for all passengers to battle with between watching the waves, the sunset or the dancing lessons in the Atrium (that term is an interesting remnant of the Roman civilisation which made it difficult to shake of the amphitheatre associations I described last time). Instead of focusing on the numbers, I found my mind drifting back to another book I’d read before setting off on this trip, one that dealt with nature, this time in the context of poetry, and hadn’t pressed my anti-scientism button to quite the same extent, but enough to explain why my mind now drifted off in that direction. Before setting foot on any deck, I had completed my reading of Jonathan Bate’s The Song of the Earth. Its rich and intriguing exploration of the relationship between poetry and nature was reshaping my understanding of both nature and poetry. I took it with me onboard ship along with his biography of John Clare, a sensation in his time as a peasant poet, an English equivalent of Robert Burns. The lifelong theme of his poetry was nature. His almost obsessional life’s work was a vast collection of poems rooted in his passionately intense and minute observations of the natural world. I had naively thought that the cruise would bring me closer to the sea in a way that would deepen my relationship with nature. 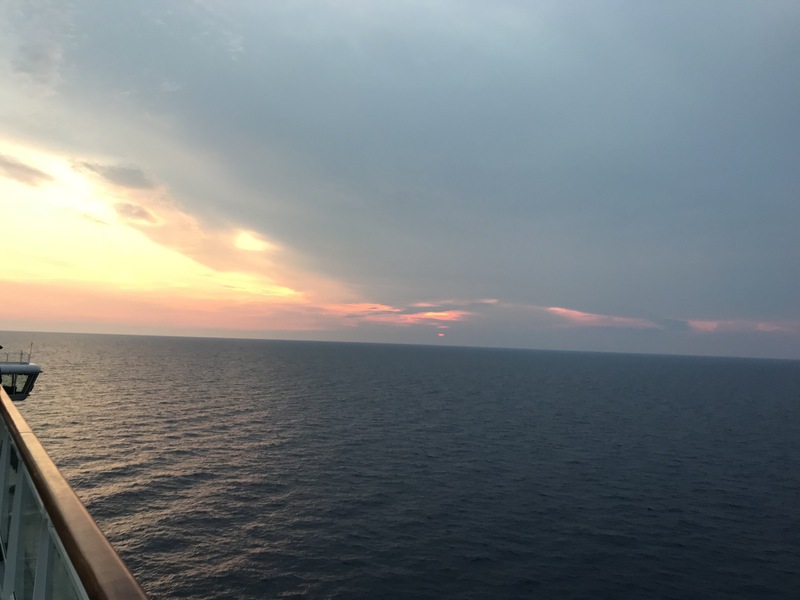 I had underestimated how hard the glittering carapace of the cruise ship would make connecting with the sea it sailed on, and how the instrumental architecture of the docks we landed at would virtually delete from sight the land we disembarked on. Cranes and containers, warehouses and duty free shops, competed for my attention instead. Even driving through the countryside near Livorno, on the way to Pisa, had its ironic contrasts: on the right flourished green glades of umbrella pines opposite the war machine of an American army base. Even so the conclusions Bate had reached in The Song of the Earth were still rattling round my head. Murray implies that the vastness and untamability of Australia mean that the peculiar power and sacredness of that land may still be sensed. He christens this religious sense ‘Strine Shinto.’ His own poetry – though tempered with wryness, irony and self-deprecation – undertakes a complex integration of the ancient idea that nature is the book in which a transcendent God writes his presence with a kind of secular Shinto which serves as the ground for an environmental ethic. 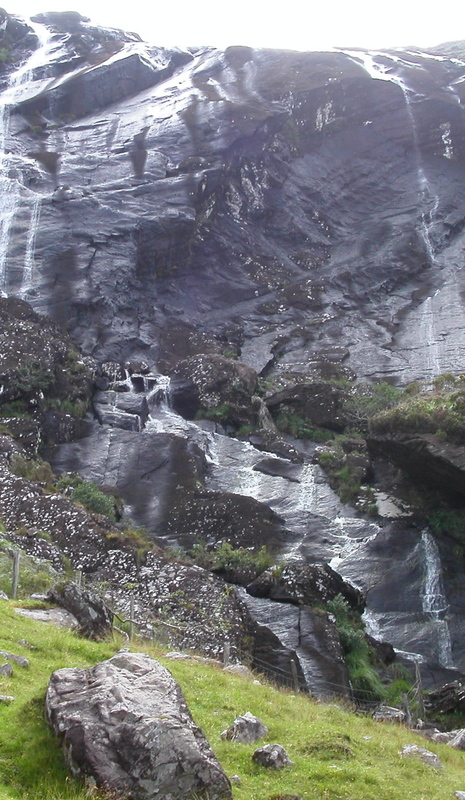 Advanced Western culture has a distinctive and perhaps exceptionally divisive understanding of humankind’s relationship to nature, an understanding which may for convenience be traced back to Baconian empirical science and Cartesian philosophical dualism, and which was further developed in Kantian idealism. If ‘world’ is, as Ricoeur has it, a panoply of possible experiences and imaginings projected through the infinite potentiality of writing, then our world, our home, is not earth but language. . . . There is a special kind of writing, called poetry, which has the peculiar power to speak ‘earth’. Poetry is the song of the earth. The sun was almost set now. Time to go back to our room and listen to the news before attempting to go to sleep, in my case with the usually reliable sedative of a good book. In a letter of 13 November 1925 to his Polish translator, Rilke explained his purpose in his master work, the Duino Elegies. He considered these meditations as responses to the transience of all earthly things. In the face of transience, the poet must undertake the work of transformation. . . The language of unification and transformation, the yoking of earth and consciousness, the divinisation of the immanent world as against a withdrawal to a transcendent realm: these are all the moves which Wordsworth made in ‘Tintern Abbey’. The phrase ‘as against a withdrawal to a transcendent realm’ struck a warning bell to which I will return later in this sequence – shades of reductionism again perhaps? The poetic articulates both presence and absence, it is both the imaginary recreation and the trace on the sand which is all that remains of the wind itself. The poetic is ontologically double because it may be thought of as ecological in two senses: it is either (both?) a language (logos) that restores us to our home (oikos) or (and?) a melancholy recognising that our only (oikos) home is language (logos). It relates to something I was already aware of: transience. 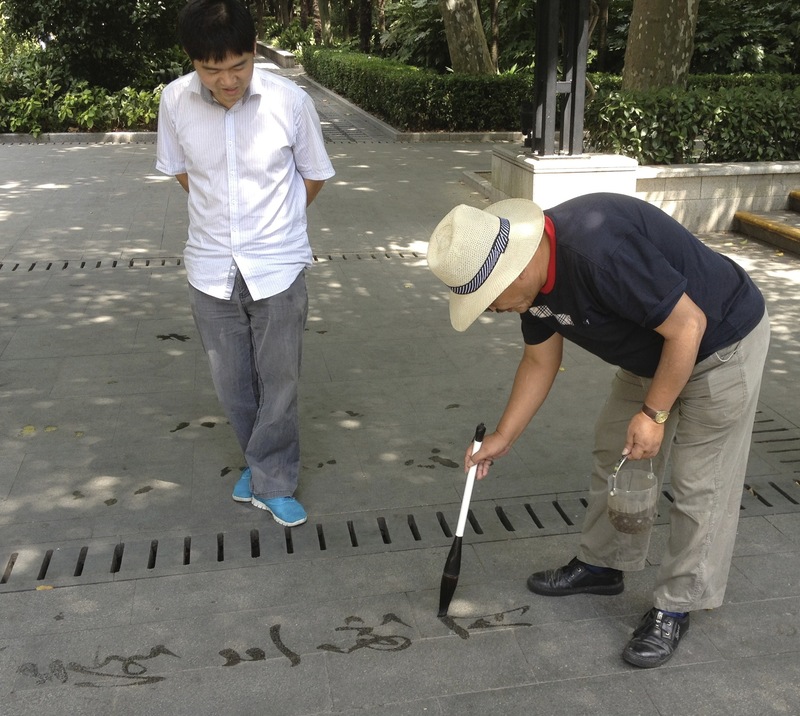 A haunting example cut literally across my path in China when I saw a man writing in water on the path of a Shanghai park. I learnt that this was a symbol of transience, of how all things fade eventually as time goes by. When we got back to our cabin we watched Sky news, our default channel and not my preferred fare, which on this occasion was focused partly on the earthquakes in Indonesia. There had been a second one, slightly weaker than the first but still causing damage and possible loss of life. We promised ourselves we’d check with our steward the following day to make sure his family were all OK.